March 2nd is the birthday of Dr. Seuss, the gifted author who provides so many children with a multitude of indelible memories. Dr. Seuss’ birthday is even more special now since it is also “Read Across America” – a day to remind us how wondrous the world of books can be. 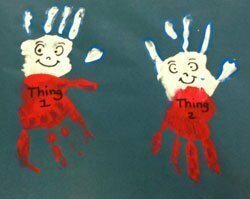 Here at the Preschool we have been celebrating the books of Dr. Seuss. 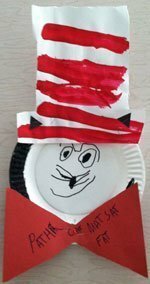 The children have created “Cat in the Hat” hats, learned from Horton that a “Person is a person, no matter how small” and created a “Thing” parade. Dr. Seuss’s famous rhymes inspire our children to create word families with rhymes of their own. In gym, the children “picked” 10 apples and put them up on top, celebrated “The Foot Book” with heel/toe games, and found “Red Fish, Blue Fish” to balance on their backs as they crawled like “Yertle the Turtle”. 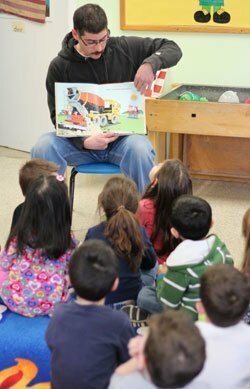 Our reading celebration didn’t end with Dr. Seuss. Community members with a variety of different jobs and interests visited our classrooms to discuss what they do as well as share special books with our children. The whole world can sit in our hands when we hold a book. Why not share a book with someone special today!